Professor Bill O’Neill, Head of the Centre for Industrial Photonics, leads IfM research into the development of industrial lasers. He discusses the current role that precision industrial lasers and other technologies are playing in increasing capability and productivity in manufacturing. The production of parts has traditionally been done through cutting, milling, machining, forging, casting and welding. The industrial laser revolution that began in the 1960s is now a standard method of digitally-driven production that offers high flexibility, reliability and speed. Most manufacturing now uses some form of laser technology to undertake some of these traditional tasks. However, it is the evolution of laser technologies for precision engineering applications at the nanoscale that is one of the key developments driving the next production revolution. Lasers – together with other disruptive production technologies that have been on the horizon for some time – are now starting to have a real impact on manufacturing. Digitalisation is increasing the connectivity between people, products, processes and the supply chain. Combined with the rapid development of artificial intelligence, self-learning machines and robot technology, it heralds a new period for production. These technologies – particularly production technologies that are flexible, reconfigurable and driven by digital descriptions such as CAD/CAM systems – have been slowly evolving over the past 20 years. We are now are in a position where products (both their physical and material properties) can be described in the virtual space very well. We have the digital data that describes a product and machines that can be manipulated to either cut-out one million identical parts or cut-out one million unique parts without any disadvantage in terms of cost or time. Our research focuses on three key production processes – industrial lasers, additive manufacturing and nanomanufacturing. We are researching laser-based techniques to cut, weld, melt, machine, structure, pattern and transform materials. There has been huge growth in laser technologies, particularly precision laser processes, since the early 2000s, with the invention of the high-power fibre laser. Fibre lasers are very robust and, because the technology is used in many R&D outputs from the communications industry, they have developed very quickly. The high-power laser industry has been able to piggyback on the billions of dollars of investment made in the communications sector to develop its own variants of high-power lasers. Experimental set-up in the Centre for Industrial Photonics. Credit: Nadeem Gabbani and Krste Pangovski. Within the research context, we are trying to make sure that laser technologies play their part in the next production revolution by enabling automated manufacturing and increasing flexibility to change on demand. We can digitally drive all of our toolsets, they can be monitored and measured, so lasers can be easily incorporated into factory networks. The laser industry by itself only has a capital value per year of around $10 billion, but it supports $2 trillion worth of products. For example, the smart phone would not exist in its current form without the laser. Even the data it relies on is moved around the world by lasers. 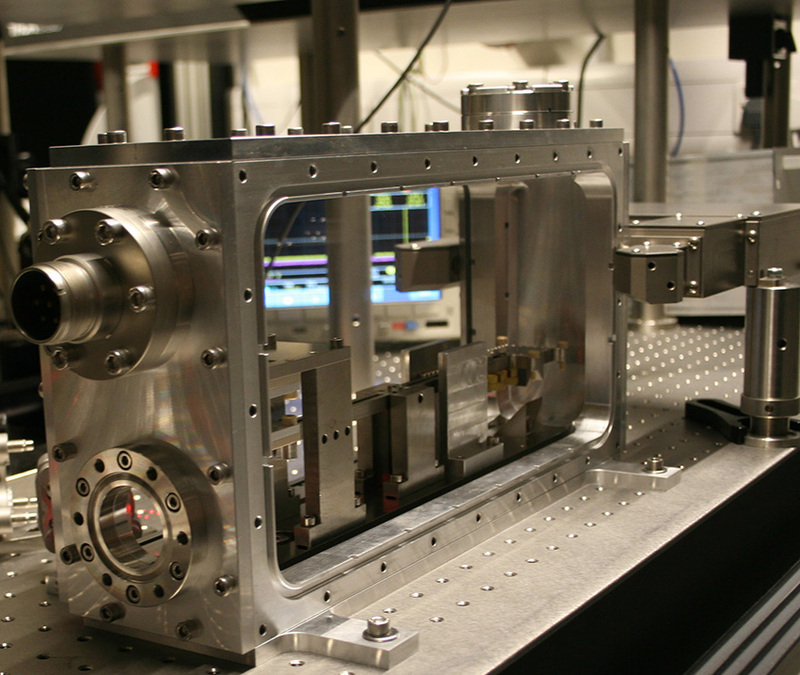 And whether it is a low- or high-power laser, the toolset has a vital role to play in the future of production. Titanium coatings for aerospace and biomedical components. Hard-facing for the tool manufacturing industry. We are developing metal coating techniques using this new form of additive manufacturing to deliver multi-material systems that offer nanoscale functionality in macroscale components, such as higher lubrication performance and increased wear resistance, for applications such dry film lubrication in gearboxes. When you reduce the need for liquid film lubrication, you make power transfer through it more efficient. We are also working on enhancing the lifetime of blade components in steam and gas based turbine generators, giving significant costs savings to the energy generation sector. One of the problems with conventional metal additive manufacturing technologies is that deposition rates are incredibly low, between 100cc and 200cc/hr. New developments of our supersonic laser deposition process will, we think, be able to achieve around 5000 to 7000 cc/hr, even for hard to work materials like titanium. We are making great progress in depositing materials with a near machined edge quality, which means products of all sizes can be built incredibly quickly. This technology is showing great promise in a wide range of sectors and is the principal technology being developed by the university spin-out company Laser Fusion Technologies Ltd. Additive manufacturing (AM) is a hot topic. Although it is a technology that we have been working on for 30 years and we have seen its application in a number of different areas, there are two growth areas in which AM is a potential game-changer – biomedical and aerospace. Following 30 years of investment in techniques, materials, machines and processes, AM is now in a strong commercial position and we are now seeing companies like GE and Stryker investing billions of dollars to put AM technologies at the centre of their production operations.In the biomedical sector, where the production of metallic implants still uses traditional techniques such as forging, there is a dramatic move towards exploiting AM technologies. Although additive capabilities are becoming more widespread, machining will still have an important part to play. The objective is to make a better part, with greater functionality such as enabling bone to grow and fuse with metal implants, leading to products with a higher value and greater patient benefits. Nanotechnology is another area that has the potential to change dramatically the future of production over the next 10 to 15 years. Nanomanufacturing involves the manipulation of nanoscale materials to make novel materials with superior qualities. We have a number of research projects with the US Air Force using laser-based techniques to develop improved nanoscale surface features for anode materials that can withstand intense electrical fields, and minimise outgassing of hydrogen in high energy microwave devices. We use picosecond laser technologies (ultra-short laser pulses) with in-process Raman microscopy to pattern graphene layers and create defects for greater functionalisation of graphene. A new suite of pulsed laser deposition technologies is being developed to create nanoscale layering of materials for the direct writing of functional electronic devices. Our research team is also working with Dr James Elliott in the Department of Materials Science and Metallurgy to further the manufacturing technology for gas phase production of carbon nanotube (CNT) fibres and films. These new nanoscale materials show substantial promise, with significant improvements in mechanical, and electrical performance compared to conventional materials such as carbon fibre. Greater demands and expectations are being placed on UK manufacturing to support economic growth. The UK government’s Industrial Strategy White Paper is pushing investments in new materials, new technology and new manufacturing processes. Now our leading research organisations are being challenged to match our research successes with new levels of commercial exploitation. To meet this challenge, we need Innovation Centres at key university sites across the country to accelerate the transition of research outputs from the lab bench, through to alpha and beta scale demonstrators within an Innovation Centre, and onwards through to Catapults and ultimately the industrial base. This is the model that we are working on at the IfM and across the University of Cambridge more broadly. These new technology developments will only lead to a new production revolution if we increase productivity and drive down costs. Production innovation should result in more innovative and competitive products and services. We can only do that if we maintain quality, or guarantee quality. Quality assurance systems, and new process technologies combined with sensors and control systems must be integrated to produce higher performing production operations. The future research focus of the Centre for Industrial Photonics is to develop new directed energy-based production technologies such as lasers, ion beams, or particle beams, with a high level of intelligence and machine learning. We must take the expert out of the production equation, and build expertise into the machine, and into the manufacturing system, and thereby offer industry higher performance and true “right first time” production operations. Medical implant specialist Stryker Corporation has been collaborating with Professor O’Neill’s research group over the past 20 years to develop Additive Manufacturing technologies for the production of biomedical implants. 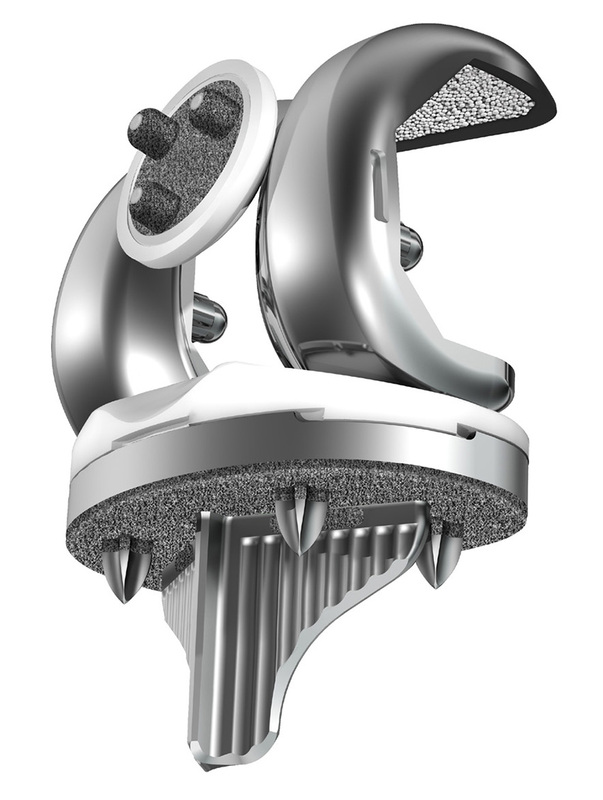 Stryker first investigated additive manufacturing (AM) in 2001 at the University of Liverpool, working with Professors O’Neill and Christopher Sutcliffe, and has been developing the technology to additively manufacture surgical devices like knee implants, tibial baseplates and titanium posterior lumbar cage spinal implants. 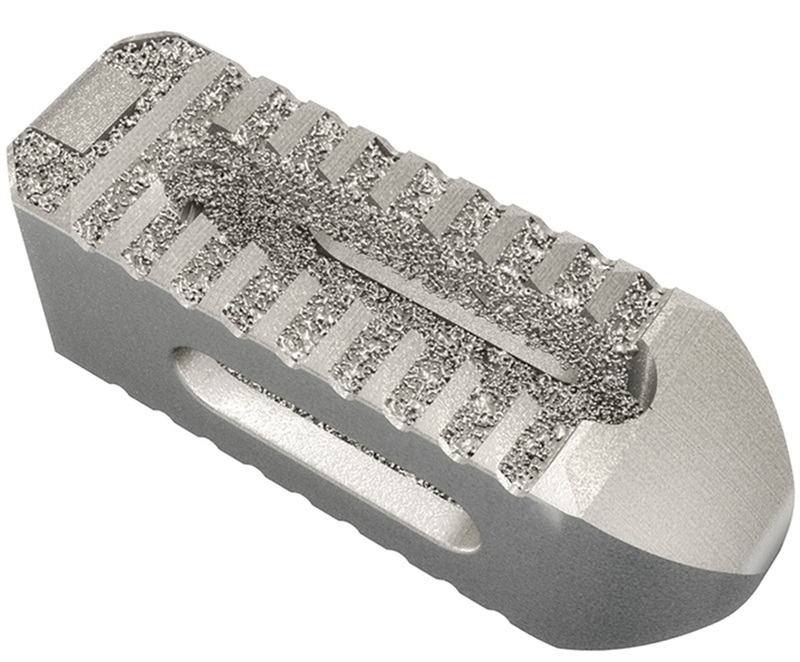 The additively manufactured metal implants have an outer porous structure that resembles spongy bone tissue and encourages accelerated osteointegration to connect the implant with the patient’s own bone. This work culminated with the opening of a $30 million additive manufacturing facility at Cork in the Republic of Ireland in 2016. The new facility has become the hub for Stryker furthering its R&D into advanced manufacturing techniques for creating custom medical devices for patients. Using a combination of additive manufacturing and robotic surgery, patients may one day be in the operation theatre having cancer removed, while at the same time an implant is being additively manufactured next door to perfectly fit the space left after removal of the cancerous bone.